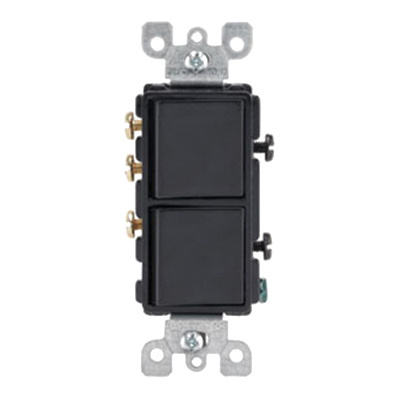 Leviton Decora® Commercial grade 3-Way 1-Pole AC combination switch in black color, has voltage rating of 120/277-Volts and current rating of 15-Amps. It features thermoplastic construction. This switch with grounding, has maximum load rating of 1/2 hp at 120-Volts and 2 hp at 240 - 277-Volts. It supports wall mounting and offers side wired terminal connection. Simple, functional design of this switch permits you to save space wherever the switch is installed. Switch is UL listed and CSA/ISO 9001 certified.